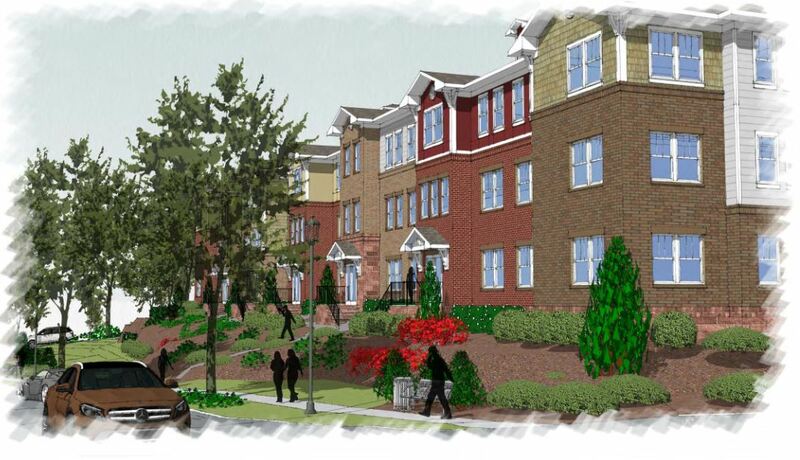 Humanities Foundation has begun construction of Glenwood Ridge Apartments, an 82 unit development for families in Richmond, VA. Valued at more than $18 Million, the complex will be built in the Chimborazo community near the rapidly – gentrifying neighborhood of Church Hill. The development will consist of two elevator served buildings built to an Earthcraft Gold Standard. Unlike suburban developments, common area amenities will be located within the buildings, which include: a fitness room, computer room, leasing office, community room, food pantry and a central laundry facility. Additional on- site amenities will include a picnic shelter, playground and community garden. Unit amenities will include a refrigerator, range/oven, garbage disposal, dishwasher, microwave, washer dryer hookups, carpet, tile, blinds, ceiling fans, walk- in closets and coat closets. In addition to design input, the Humanities Foundation and VHDA were able to utilize income averaging. This methodology allows the inclusion of more people on both upper and lower ends of the income spectrum enabling a more diverse population of residents which include firefighters, teachers and police officers. The site is the former location of the Richmond and Henrico Railway Company Car “Trolley” Barn and will contain a historical public access area. Construction is expected to take 14 months. KBS is the contractor, Timmons Group is the civil engineer and Martin Riley Associates is the architect. Merchants Bank of Indiana is the construction lender and Freddie Mac will provide permanent financing. CAHEC is the syndicator/investor. Glenwood Ridge is a joint venture with James Doran Company and is the twenty-seventh LIHTC apartment complex developed by Humanities Foundation.